CHARVEL made the 650 XL Professional between 1988 and 1991. The 650 XL Professional was a custom version of the 550XL. This guitar used the same active pickups and circuitry as the Classic Series 475 Special model. The additional middle position pickup further increased the tonal variations. Jackson (shark tooth) pearl inlays and a bound rosewood fingerboard further enhanced its appearance. 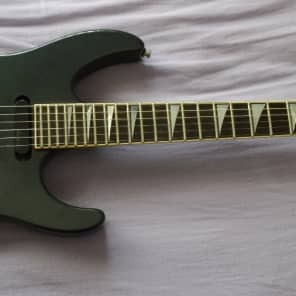 Black hardware includes a Floyd Rose licensed double locking tremolo, two J200 bi-level humbuckers at the neck, middle position and one J50-BC humbucker at the bridge. Controls are three knobs: master volume and two tone knobs and a five-way pickup switch. Finish options were snow white, pearl blue, pearl red, magenta, platinum, desert crackle and metallic black, with matching headstock and body. 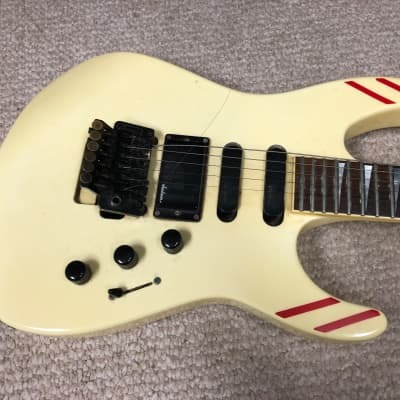 In the 1991 Jackson/Charvel catalog the 650 model is described as the 650 Custom (see second photo above): this model has neck-through "Soloist" construction, with JE-1200 active midboost circuitry. It was endorsed by Hank Decken of the band Nevada Beach. 2002 $300.00 good Exellent Guitar. I would never sell it for less than $500. Most days, i would not sell it for $500. Take the CHARVEL 650 (XL / CUSTOM) price survey. What is the difference between the 650xl professional and the 650xl contemporay? I have noticed some are active pickups and some are not. I have a Charvel 650xl with active pickups. Serial number C000546. I love this axe! I bought it in 1990. I would love to learn more about it. I can be reached at ukbleeding@yahoo.com Thank You for your time. I don't think there was a 650 XL contemporary series model, but there was a 650 Custom. I have updated the 650 page and deleted the 650 contemporary page. This model should have been in the Charvel professional series - so I have moved it! Buy CHARVEL 650 (XL / CUSTOM) electric guitars.